A few weeks ago I was fortunate enough to take part in a masterclass in London, organized by Napa Valley Vintners and led by Tim Atkin MW. About a dozen representatives of Napa wineries came to introduce their wines to us and talk about the present and future of winemaking in Napa. Apart from a few bubblies, the tasting was to focus on classic reds: mainly Merlot and Cabernet Sauvignon single varietal wines, and a couple of blends. Wineries present were, in order of appearance, Schramsberg (sparkling Blanc de Blancs, i.e. made only from Chardonnay grapes), Luna, Twomey, Chimney Rock, Long Meadow, Pine Ridge, Robert Mondavi, Shafer, Silver Oak, Viader, and Waterstone. Before saying anything about the individual wines, it’s probably best to start with a brief introduction to how Napa Valley came to be one of the top American winemaking regions it is today. 1861 saw the opening of the first commercial winery in Napa. By the late 1880s there were 140 wineries operating in the region. However, it wasn’t long before the region was hit by phylloxera (a root louse that also destroyed most of Europe’s vineyards in the late 19th century), and then prohibition (1919). Neither did much good to the wine industry, and during Prohibition most vintners went and found themselves other occupations. Only a handful remained who were producing so-called ‘sacramental’ wines, or wines for home consumption, and using varieties that were not necessarily the best. In 1933 Prohibition law was repealed and Napa began to recover. It was in 1966 that the first new winery opened, under the ownership of Robert Mondavi. Today there are about 450 wineries, and this probably has a lot to do with the huge success of California wine after the famed Judgment of Paris of 1976, where Napa wines triumphed over French wines in a blind tasting organized by the today legendary Stephen Spurrier. 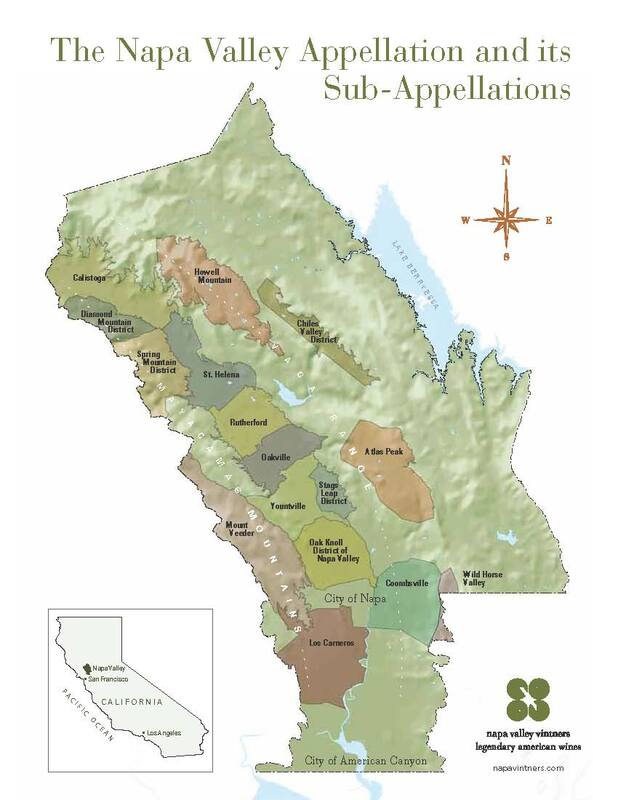 So, it’s a lot of wineries for a fairly small area, which is very diverse both in its geology and its climate. The wineries themselves are typically small and produce small yields (80 per cent of wineries put out less than 10,000 cases a year, and 95 per cent of the wineries are family-owned). There are 40 grape varieties planted in Napa, of which Cabernet Sauvignon is the most successful. The three vintages we tasted were, from warmest to coolest, those of 2002, 2005 and 2008. Even though all wines were of a consistently high quality and certainly deserve to be called premium, here I’m only going to detail those I liked the best. So, Pine Ridge to begin with. Three Cab Sauvs from the Stag’s Leap District of Napa. The grapes were harvested at night, sat for 2 days in a cold soak, and were fermented at a high temperature of 32 C for a maximum of seven days. Wines were aged in 100% French oak. Pine Ridge 2002 – Darkish ruby colour and an intense, delicious nose with coffee, leather, black pepper and cedar wood. The spicy palate is rich in coffee and lots of very approachable ripe red fruit. Sweet spice, intense, medium-bodied with warm alcohol. Very, very enjoyable. Pine Ridge 2005 – There is more meat and mushroom and less fruit in this wine, both on the nose and on the palate. These tertiary flavours sit beautifully with the underlying sweet spice and ripe fruit. The wine has something almost biscuity about it. My favourite of the three. Pine Ridge 2008 – Ruby turning purple, with a nose that offers more pure fruit, predominantly red cherries. Some wood and cinnamon also make their appearance on the palate, together with ripe red fruit. Alcohol seems lower? Not as exciting to me as the other two, but this is probably purely a matter of personal taste. Robert Mondavi 2002 Reserve, Napa Valley – A classic Bordeaux blend with over 80% Cab Sauv, and the rest a blend of Merlot, Cabernet Franc, Petit Verdot, and Malbec. Striking, lively ruby-garnet colour, just beautiful. Lovely nose and palate of coffee, peppery spice and leather. Tannins feel a bit grainy but the alcohol is nice and smooth. Ripe fruit and spice nicely integrated on palate, warm, high-alcohol finish. The wine was made in 100% new French oak, with long cold fermentation, in biodynamic fermenters and with gentle extraction. The colour is deep ruby; the intriguing nose offers intense earthy, meaty aromas and pepper. Can’t wait to bite into this one! I find a savoury, peppery palate with green herbal notes. A medium-bodied wine with great acidity, high tannins and high alcohol. Beautifully crafted, serious, just great. Miss Erdos, thank you for so accurately and elegantly describing the history of winemaking in Napa Valley. I should also add that Delia is my mother and you both share an appreciation for the 2005 vintage of our Viader flagship blend – for many of the same reasons! This wine is great with food due to that mouthwatering acidity, and the aromatics are unique for a Napa Cab. Thank you very much for the mention. I know my mother very much enjoyed the session with Tim and all the students. Please let us know if you come out this way and I’d be happy to show you the vineyard’s incredibly steep downhill rows that make our wines so special. Thank you so much for your kind comment and I apologize for taking so long to get back to you. It will of course be my pleasure to pay a visit to your winery one day, I hope in the not-too-distant future, as a trip to California is certainly on my to do list! All best wishes for the coming harvest – in Israel (where I’m currently visiting) they’ve already started – how about Napa?